NYFW has officially started and I can't wait to attend this event in the next days, actually tomorrow! This will be last outfit post to enjoy until I'll come back home and share with you all the wonderful moments captured through my lenses from NYFW. In the meantime you can follow my journey on Instagram. Have a wonderful week and I hope to "see you" soon! P.S. I'm wearing a "heart necklace" received from my creative friend Georgiana, a Etsy shop owner. You look great! This look is very stylish and bright! Especially I like this heart necklace which can complete and brighten any look! Thank you for nice photos! I have joined ur blog and will be very happy if you join mine! Welcome to my blog! Great outfit. I’m in love. so excited to see all your amazing photos! LOVE this outfit..every piece and that necklace was a PERFECT ADDITION! Loved this heart, I thought YOU made it, to be honest! Love your new hair color and cut! You look amazing and I am sure you will be fantastic at NYFW. as always Veronica. I admire you for hours. I love your style! wow, great GREAT outfit!! I love this combination of boyfriend jeans and heels! :) and black and red seems to be made for each other! :) perfect! B. Such a cute look! Loving your necklace and jeans! Have fun at New York Fashion week! Love your look! and love the heels too. I die for your bag!! your style is so amazing, I love that your not afraid of color you inspire me to buy and where more colors…..
Ahhh that necklace is fabulous, loving this whole ensemble!!! That’s a nice popping red color bag! I love your outfit you look pretty! just found your blog and love your aesthetic! and heyy i actually just ‘started’ a new blog! i’d love if you’d come take a look and follow, if you like! And your hair looks so great – wish I looked that good with dark reddish hair! Haha but we wont go there! Fabulous look! You are super stylish! Love it. I love the shredded jeans and the pops of red in this look! Really cool! Looking, cosy, warm and stylish. 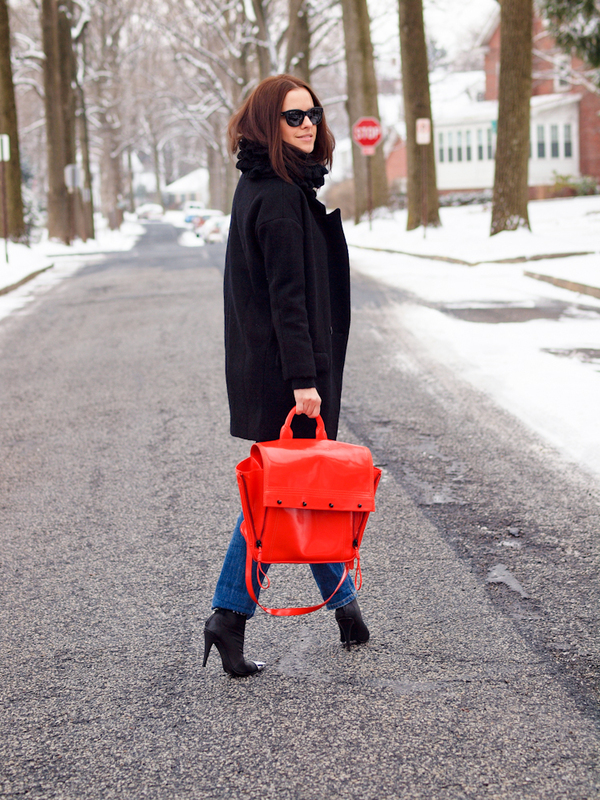 Love the pops of red – especially the bag! Hope you’re keeping well V.
love this look! That bag!!!!!!!! This is such a pretty outfit! I love the color of the necklace and I am definitely a new follower. Love this look – and loved seeing how you styled this bag at NYFW! love your necklace! and the bag is so stunning! 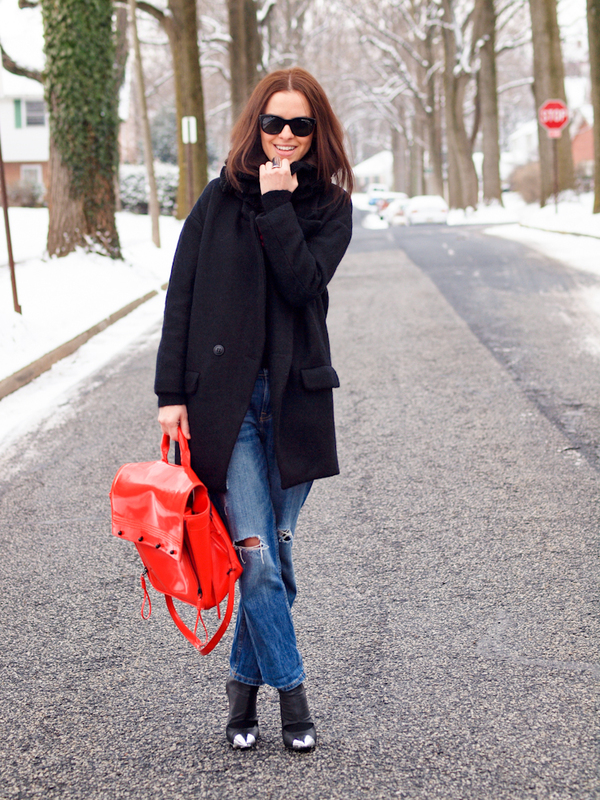 I am obsessed with this all black, distressed denim look with a pop of red! I have been hunting for a great pair of distressed jeans.